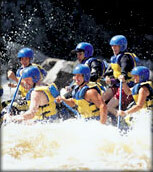 If you aren’t sure what to expect on your Maine whitewater rafting trip, we can help! Our professional guides love whitewater rafting in Maine and will makr sure you enjoy your experience, and that means looking out for your safety. As with many outdoor adventures, people get caught up in the fun and forget that part of the fun is making sure you’re safe. With help from our guides, we’ve put together a list of things you will want to remember before you embark on your Maine whitewater rafting adventure. 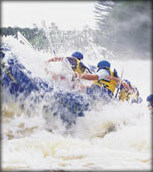 Book your whitewater rafting trip on a river where you are going to be comfortable and confident in your ability. Our three rivers (Kennebec River, Dead River and Penobscot River) offer a variety of different challenges for all skill levels. Be sure you know what to expect before you hit the rapids. Be honest with yourself and your group when it comes to your physical ability and select the river that’s right for you. Be prepared to swim. We don’t expect you to be the next Michael Phelps, we just ask that if needed, you know how to swim yourself to shore. Listen to your guide. When you arrive, your guide will greet you and be the best source of information during your trip. 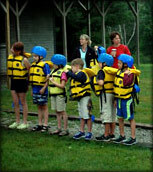 Our guides have significant first aid experience, CPR certification and have completed the appropriate on-river training for whitewater rafting in Maine. And last but not least, our Maine guides are friendly and very knowledgeable and have a vast amount of experience on the water and know what will make your Maine whitewater rafting experience last a lifetime! 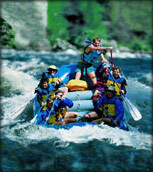 To make sure that you have the most enjoyable whitewater rafting trip, follow the safety tips above or contact the New England Outdoor Center staff for any questions or advice about your skill level.